I started my Thanksgiving Day morning in Gulfport FL. I am truly thankful to wake up to such a quiet, and uncluttered little community in retirement. 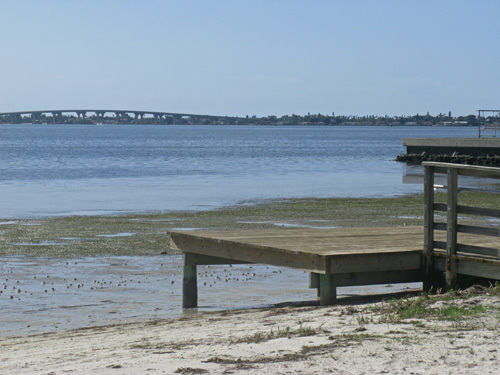 Hidden away on the edge of Boca Ciega Bay, west of St Petersburg, Gulfport personifies the laid back lifestyle we all enjoy on the Florida beaches. Thanksgiving Day is especially appropriate to be grateful for the beauty and serenity of this sleepy little coastal town. This Gulfport Thanksgiving Day dawned cool, sunny, and still. 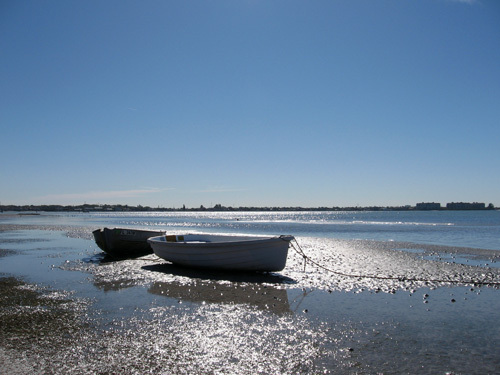 The bay was calm, the breeze was barely noticeable, and the clean salt air was inviting. Retirement just does not get any better. I am fortunate to live in such a beautiful area, and be able to supplement my teachers' pension (actually more than double it) just by waking up to this wonderful Florida scenery. I started the early morning with a sunrise Thanksgiving Day run along Shore Blvd South. The stillness was magical. The only people I saw were other runners gratefully training in the soft light of pre-dawn. I turned north on Main Street. It was completely silent as I sprinted down the middle of the road to begin the first of several intervals. It is almost overwhelming to feel the thankfulness that threatens to burst out of me. If that sounds sappy, I apologize. I just do not know any other way to describe how lucky I am to be in this situation. Where else on the planet could I start Thanksgiving Day, and almost every other day, in such a beautiful, healthy, and profitable place? Where else could I wake up to this low-key beach lifestyle, where I can use healthy eating and fitness to hold off old age...all while making over $200 per day online? After I showered, had my usual Paleo breakfast of a scrambled eggs omelet filled with mushrooms, onions, bell peppers, and sausage...and meditated for 20 minutes...I grabbed my old Trek 7000 and headed out to see how others were spending the early hours of their Gulfport Thanksgiving Day. 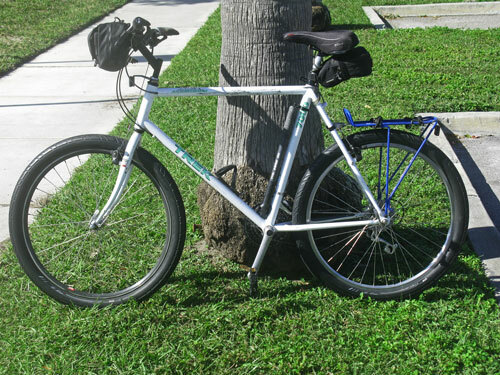 My battered old mountain bike, a 1993 Trek 7000, gets me around town safely and quickly. Also, since it is a huge component of my online home business, I can write-off all my costs for repairs and maintenance. It makes me money, it saves me money, and it keeps me fit. Shore Blvd South is empty and still, just after sunrise on this beautiful Thanksgiving Day. 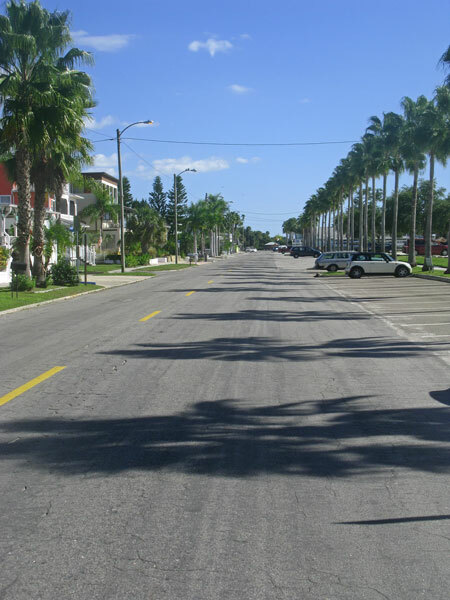 This street runs along the beach that edges against Boca Ciega Bay. Truthfully, the only time it is really busy is on Wednesday evenings when there are weekly Swing Dance lessons given at the Gulfport Casino. Not a soul around on this beautiful Thanksgiving morning. It is so peaceful to walk in the cool sand, look out at the sailboats anchorned a hundred meters away, and be prayerful about the good fortune I have to retire in this area. Above the beach is a small park. 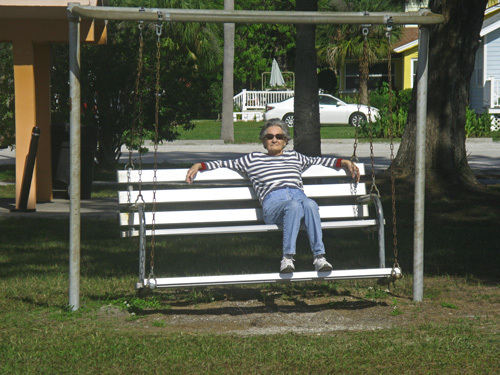 I noticed an older woman had staked out a place on the large swing, and was quietly starting her Gulfport Thanksgiving Day with a relaxed outlook. It's pretty easy to be laid back on the Florida beaches. 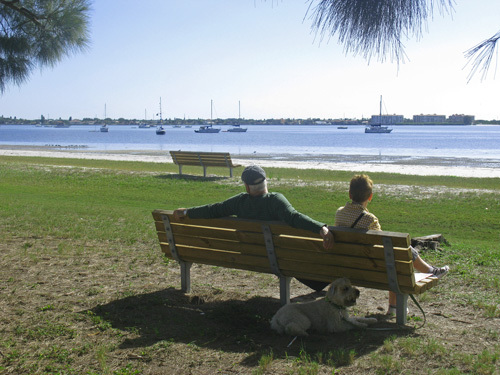 Another retired couple had brought their dog out on this cool, sunny, Thanksgiving morning to relax in the quietness of Boca Ciega Bay. The small dock at the west end lent a quiet presence. 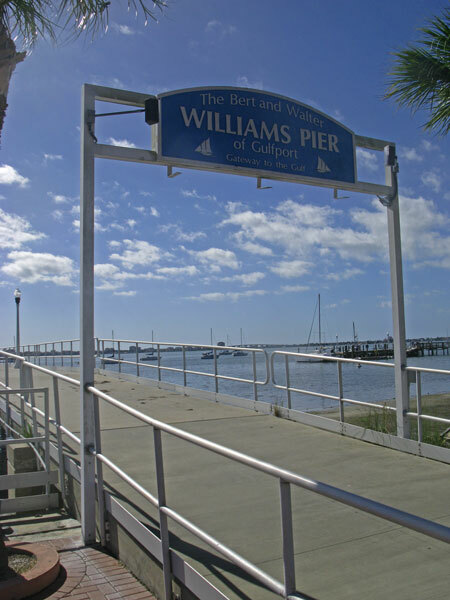 Williams Pier, which anchors the east end, was also quiet. I saw no fishermen on this Gulfport Thanksgiving morning. 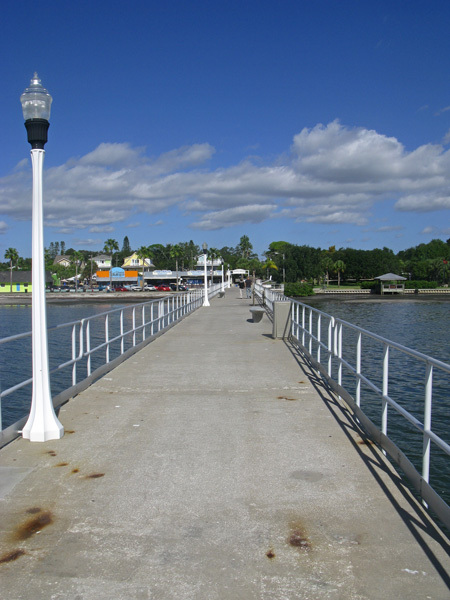 A couple were engaged in a romantic walk down the pier in the early morning. You can barely see them about the middle of the walkway. 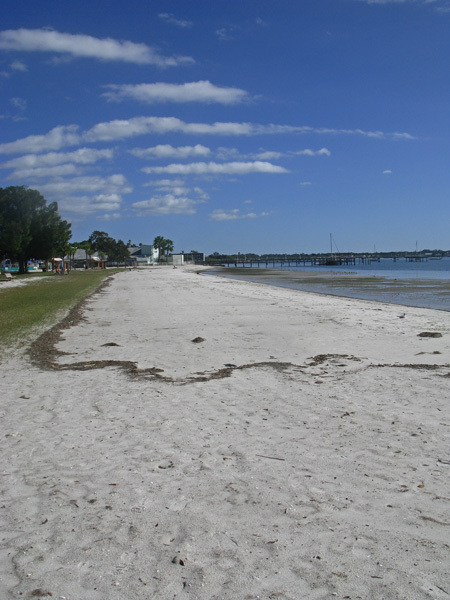 Gulfport is a great little community to share with the woman you love. 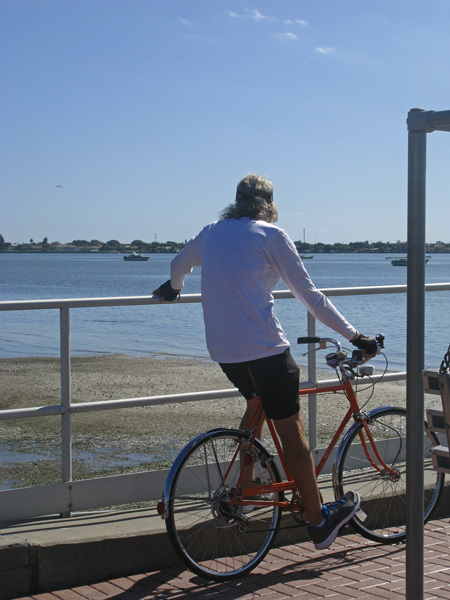 As I was leaving, another retiree pedaled up to the edge of Williams Pier to take in the serenity of Boca Ciega Bay. Fitness is a way of life in this sleepy little community. Main Street is empty during these quiet hours after sunrise on this Gulfport Thanksgiving Day. 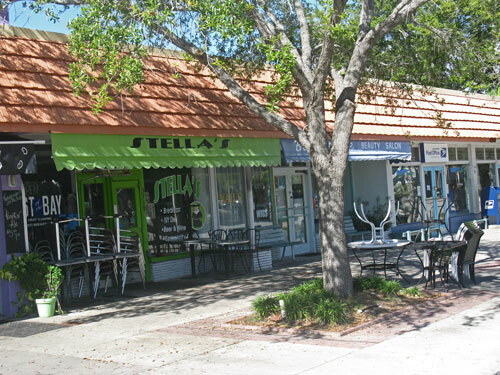 Stella's is usually the busiest place on the sidewalk every other day. I could not enjoy my retirement as much as I do without the ability to make a good profit from my MacBook Pro laptop. Granted, it is only a little over $200 per day...but, trust me, you can do a lot with an EXTRA $6000 - $7000 dollars each month. I was fortunate to be able to get involved with SiteSell. It has made a huge difference in my life. Coupled with the tax savings I enjoy because of the information my Enrolled Agent uses from Dr.Ron Mueller's eBook and CD set, I am able to keep $1000's of dollars more of my own hard earned money. There are several inexpensive Kindle books I recommend for those of you who are retired and want to profit, like me. They are full of great information...but YOU have to put it into action. They tell you how to do it, but do not take you by the hand and do it for you. 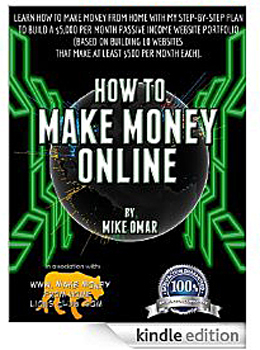 The first one is "How To Make Money Online" by Mike Omar. 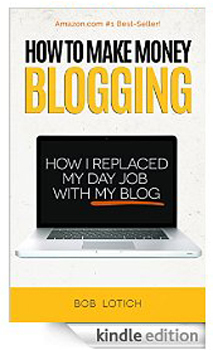 The other is "How To Make Money Blogging" by Bob Lotich. I enjoy sharing my retirement adventures with all of you. I want you all to experience the sweetness of a Gulfport Thanksgiving Day. Are you over 50...and looking for a Second Chance? Go to Florida Beach Life home from Gulfport Thanksgiving Day page.